Looking for Las Vegas February Events !? At Apex Social Club, we’ve got a good thing going on. We’re conveniently located in the Palms Casino Resort, we’ve got a killer space that boasts the best views in Las Vegas, and we’ve got some of the best entertainment offerings in the city. Come witness the latest ongoing event at Apex that has people talking…and dancing! 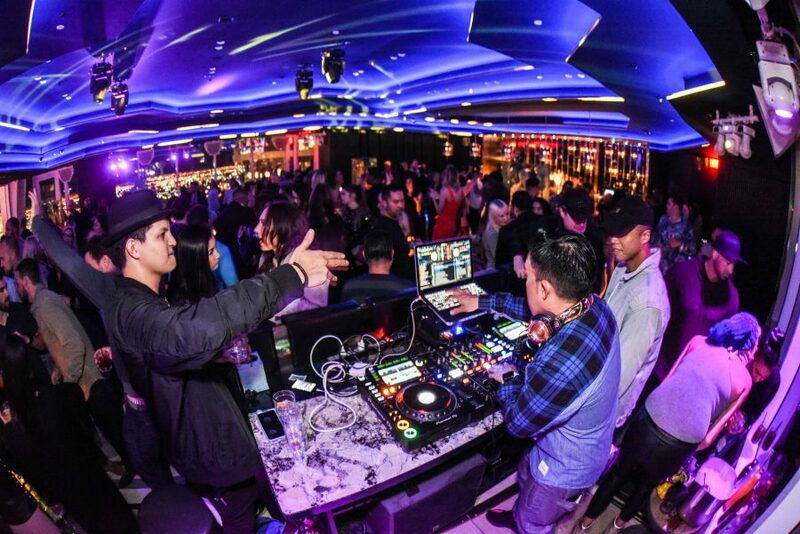 Acclaimed DJ Paul Ahi is headlining a new series at Apex: Elevate Thursdays. This is a night dedicated to deep house music, and it’s become a highly anticipated event in a very brief amount of time. 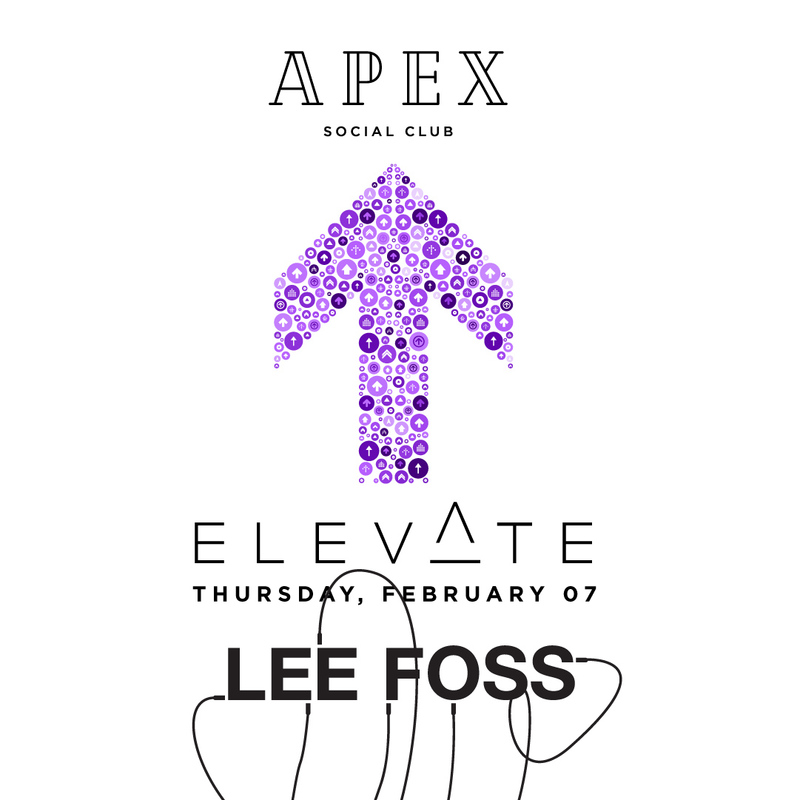 This week only, Lee Foss, a staple in the electronic world will be coming to Apex Social Club for the best EDM party in Vegas. If you’re not familiar, deep house is type of house music. Like house music, it is highly ambient and has its origins in the 80s. However, it’s differentiated by a strong emphasis on jazz/funk/soul elements, and a slightly different tempo than traditional house music–usually between 100 and 125 BPM (beats per minute). You’ll feel like you’re on the top of the world (literally) as you enjoy these rhythmic beats 55 floors above the glittering lights of Las Vegas. On Sundays, we TCB. Say what? 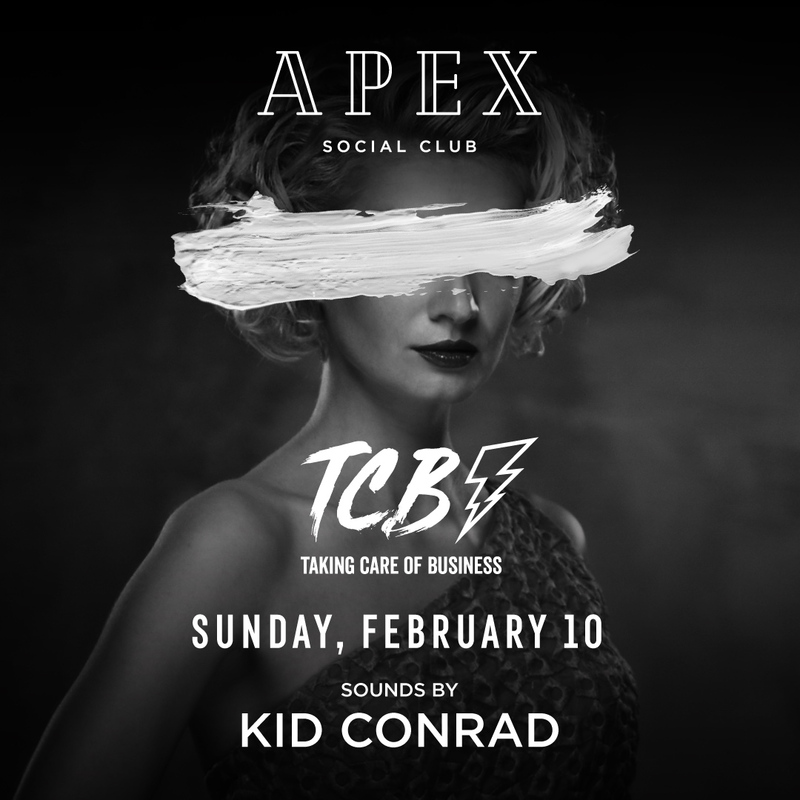 TCB stands for “Taking Care of Business,” and it’s Apex’s weekly nod to industry workers. They don’t always have the opportunity to party on Friday or Saturday, so we’re opening up our venue (and the dance floor) to hospitality workers on Sundays. It’s the perfect opportunity for them to relax and have fun on their own schedule! Good news if you’re not an industry worker: TCB Sundays are open to everyone! So even if you’re not an industry worker, you’re still welcome to come and party with us. With our location on the 55th floor of the swanky Palms Casino Resort, Apex offers a unique and breathtaking space to enjoy all the best that Vegas has to offer. Ours is truly a one-of-a-kind nightclub that can’t be missed! On February 10th, we’ve got an extra-special entertainment roster: Lucky you: both DJ CLA and DJ Kittie will be spinning. Tired of jewelry advertisements, chocolate boxes, and prix fixe menus? Hey, we don’t blame you. 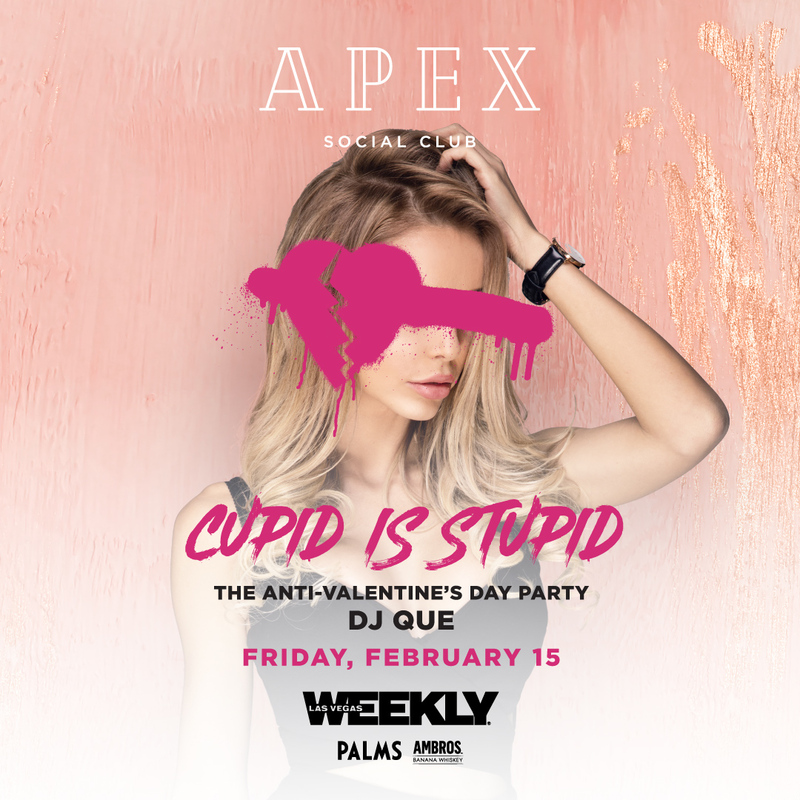 Let your inner Love Grinch shine as Apex presents the ultimate Anti-Valentine’s Day event: Cupid is Stupid! Go ahead: drink, dance, and party along with us at Apex, and forget about love for a while. As a bonus, this event coincides with the Las Vegas Weekly official release party for their yearly anniversary cover! For your listening pleasure, DJ QUE will be spinning. Ready to party…and potentially win big? Apex is pleased to present our “The Big Chill” contest. Contestants will have a chance to win a trip to Aspen! The Blackout Music label has long been renowned for its creative releases featuring the best DJ mixes. 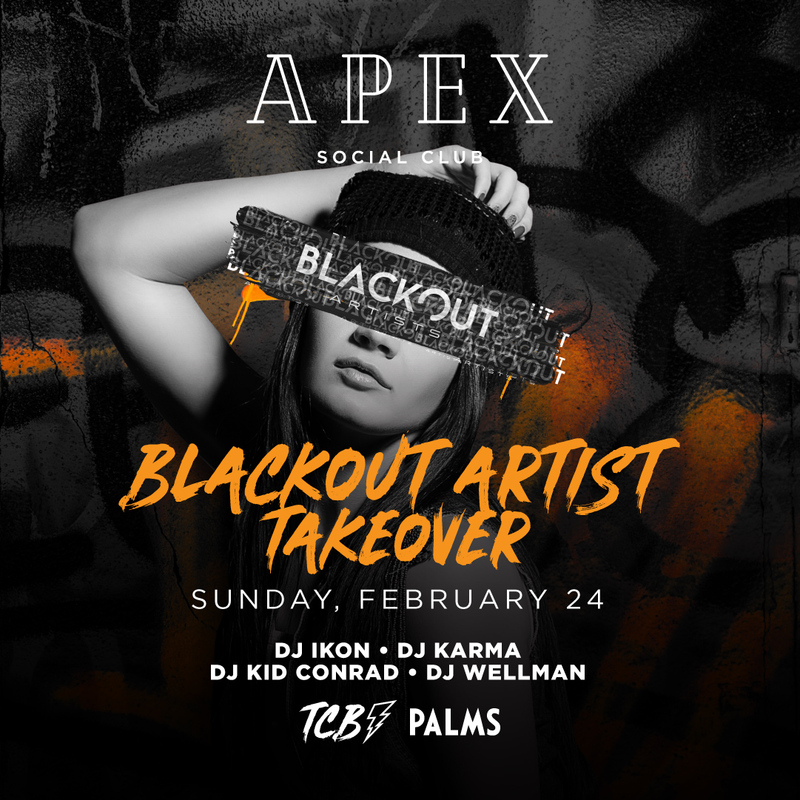 On February 24th, Apex will play host to some of the most inspiring acts from the label, including DJs Karma, DJ Ikon, DJ Kid Conrad, and DJ Wellman. These DJs will take turns spinning throughout the night, and the show promises to be incredible. You won’t want to miss the chance to enjoy these talented acts in our unique space–with the sparkling lights of Las Vegas 55 floors below you, you’ll feel like the king (or queen) of the world. Conclusion: At Apex Social Club, we pride ourselves on offering one of the most beautiful and unique venues in Las Vegas. But we don’t just want to be beautiful: we want to offer our customers a truly unique experience when they pay us a visit. That’s why we’re committed to offering the best entertainment! From creative and innovative parties to awe-inspiring sets by the world’s best performers, there’s always something incredible going on at Apex. We hope to see you soon so that you can see for yourself why we’re considered one of the best clubs in Vegas! Stay updated via our Events page so that you know when the next party will be! Which Las Vegas February Events are you most excited about?